Embattled Californian Congresswoman Maxine Waters began her political career as an ally of the Communist Party USA . 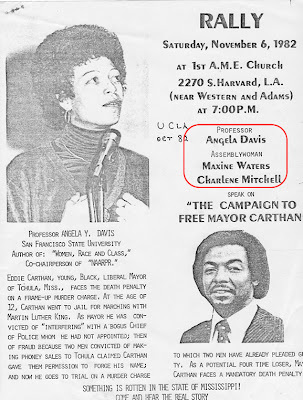 Waters supported several party front organizations including the National Alliance Against Racist and Political Repression, which was led by leading communists Angela Davis and Charlene Mitchell. This 1982 pamphlet reveals just willing then California State Assemblywoman Waters was to lend her name to Party causes. During her 14 years in the California State Assembly, where she rose to the position of Democratic Caucus Chair, Waters was responsible for such legislation as the largest divestment of state pension funds from South Africa, "landmark" affirmative action legislation, and the introduction of the nation’s first plant closure law. Waters entered Congress in 1991 and soon became a member of the far left Congressional Progressive Caucus. 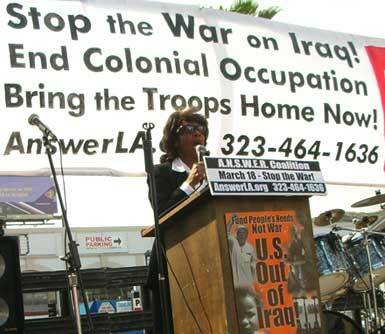 Waters has also been a prominent anti War activist and has chaired the Out of Iraq Caucus. Through her early days in Congress, Waters maintained close ties to her Party friends. 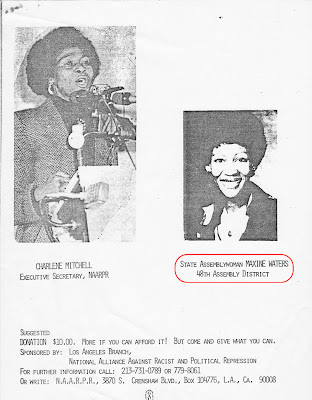 In May 1992 the Party newspaper Peoples Weekly World published a May Day supplement which included a call to "support our continuing struggle for justice and dignity" Endorsers of the call included "Congresswoman Maxine Waters, California." In October 1992, Maxine Waters was keynote speaker at a Coalition of Black Trade Unionists meeting in her home town of St Louis Missouri . the Coalition, especially in Missouri, has long been heavily infiltrated by the Communist Party. Presentations to the honorees were made by Clara James, chair of the Community Affairs Commission of the Second Baptist Church, on behalf of Maxine Waters and by Antonio Aguilar, on behalf of State Senator Hilda Solis - now Barack Obama's Secretary of Labor. H.R. 950, the Job Creation and Infrastructure Restoration Act of 1997 was introduced in the 105th Congress on March 5, 1997 by Congressman Matthew Martinez of California. It had 33 original co-sponsors, all far left Democrats, including Maxine Waters. When Maxine Waters threatened to nationalize oil companies a while back, she called herself a "Liberal". "Communist sympathizer" would have been a more honest description. 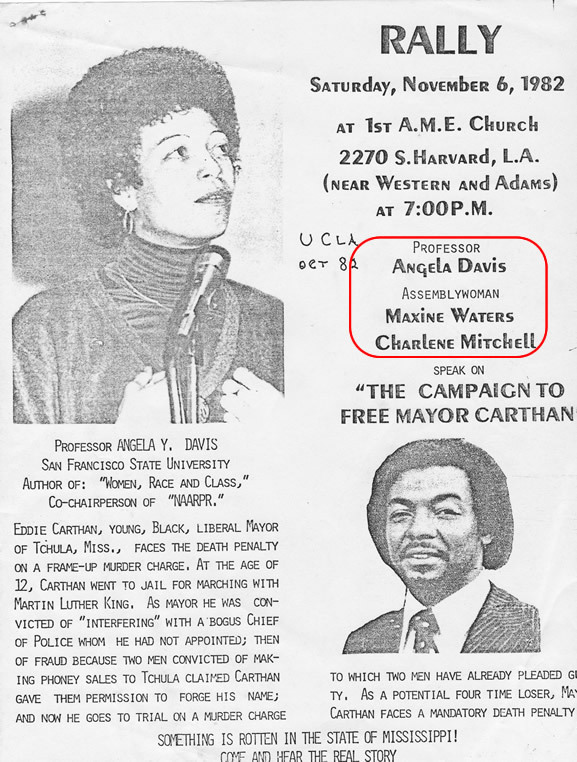 It would be interesting to see this video of Maxine Waters located in Box 103 of the Anna Braden Papers at the University of Louisville Archives and Record Center. Ya' know, since Anna Braden was a known communist and all.